We live in a society that is fast-paced and unhealthily obsessed with celebrity lives. This slightly stalkerish mentality can be seen in the many reality TV shows, sensational covers of tabloid magazines…and can be fed quite easily nowadays by the instantaneous powers of the internet. E! Online is one of the most well-known champions of entertainment news, and now you can keep up with a lot of their fascinating content through their free, self-titled app. Of course, you need an internet connection to access any of what E! Online puts up. The first tab, entitled News, is self-explanatory. All the most recent juicy details of Hollywood can be found here in article form, with video clips thrown in the mix here and there. Just tap on something that catches your eye to read the entire story or watch the clip (video ads may play at the beginning of clips). You can share a story that interests you through email, or you can add it to your Favorites list. You can also scroll through the stories’ expanded form by using the left and right arrow keys at the top right. Similarly, recent celebrity pictures can be found under the Photos tab, collected in galleries for your convenience. Under the E! 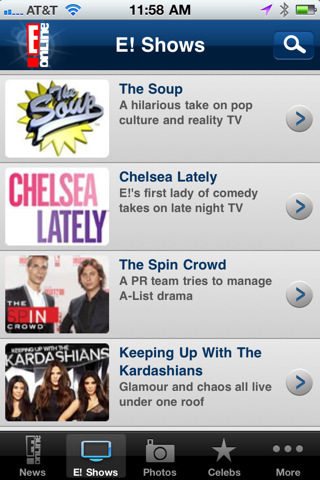 Shows tab, you can find the latest clips from E! Online TV shows, from entertainment news to reality TV. Clips can be seen through the app, and full episodes can be bought and downloaded from iTunes if you’re particularly curious. The Celebs tab is my personal favorite. If you’re like me, then the majority of the featured stories in News won’t be of huge relevance to your interests. With the Celebs tab, however, you can personalize your news feed by choosing which celebrities you want to hear about. Anything related to the celebrity of choice gets filtered in, whether the latest gossip or a photo of their latest sighting. Another interesting section can be found under the More tab (in which you can also sort articles by author and read movie reviews): the E! Talk Box. Every week, the Talk Box features a different question pertaining to the entertainment industry/pop culture, ranging from quirky to serious. Using the Talk Box, you can record your answer, send it in, and just maybe get your own 15 seconds of fame on E! News. It’s an interesting accession to the app, as it is the sole interactive portion surrounded by news bits. Sorry non-4th-generation iPod Touch owners–your device doesn’t support recording, so your 15 seconds are kind of already up. It’s a welcome surprise that such a big corporation would offer their highly informative app for free, but I’ll take it and run with it. Unfortunately, I’ve outgrown such voyeuristic (and sometimes positively flaming) news reporting, and I never was one for reality TV, so this gem of an app is almost entirely wasted of me. If you do enjoy reading tabloids and watching programs like E!, however, then this app was made for you. It’s very easy to navigate (and free, so you really don’t have anything to lose), so keeping up with the latest breaking news in the entertainment industry will be a breeze. I would like more sharing options, though; why keep your Facebook and Twitter pals out of the loop? AppSafari review of E! Online was written by Julie Guan on December 31st, 2010 and categorized under App Store, Events, Free, Fun, Music, News, TV. Page viewed 3971 times, 2 so far today. Need help on using these apps? Please read the Help Page.